Women of Soul guides pays tribute to some of the most powerful women in soul music, including Chaka Khan, Diana Ross, Tina Marie, Natalie Cole, Janis Joplin-and a special tribute to Aretha Franklin, just to name a few. This show takes a look at the struggles and the triumphs these women went through to reach the pinnacle of their success. The production of Women of Soul is written and directed by Daryl D. Brooks, whose hits with Black Ensemble include Men of Soul in 2015. "...There is significant talent - some familiar to those of us who have been going to BET for decades but many compelling new faces. Back in the day, Jackie Taylor, the artistic director, used to introduce her white performers as "non-traditional casting" with a big grin on her face. Those two latest beneficiaries, Colleen Perry (who does Adele and Joplin) and relative newcomer Hannah Efsits (Winehouse and Teena Marie with Neal's hilarious Rick James) just kill in this show." "...Two-and-half hours (plus intermission) is not enough to honor to all those deserving thereof-a shortcoming acknowledged by emcees Rhonda Preston and Cynthia Carter-and many playgoers may lament the absence or abbreviation of their favorite anthems or the often fast-and-furious renditions offered by a cast sprinting through a marathon array of costumes and wigs. All that notwithstanding, author/director Daryl D. Brooks' revue may be viewed as a chronicle of feminine progress, in addition to a showcase for some of Chicago's most auspicious rising stars." "...Powerhouses in their own right as much as in their impersonations, the soulful ladies also include Ariel Williams, Colleen Perry, Jayla Williams Craig, Jerica Exum, Jessica Seals, Hannah Efsits, Robin DaSilva, and one busy soul man, Dwight Neal. Their feats count as much as anything accomplished by the headliners in the third paragraph. Talent is talent is talent and it will definitely out." "...The powerful voices of Cythnia F. Carter along with Robin DaSilva and seasoned actor of BET Rhonda Preston mixed in well with new starlets Collen Perry, Jayla Williams Craig, and Hannah Efsits. It was also nice to see some old faces Jessica Beals, Ariel Williams and Jerica Exum returning to BET. All of these women brought together a night of sisterhood songbirds that makes Women of Soul with a Tribute to Aretha Franklin a must-see event." "...I always look forward to attending the productions a Black Ensemble Theater because I know I will leave the building filled with memories and music, and most importantly, a smile on my face. The production that will take us thru the Holiday Season, into late January is called "Women of Soul" (with a tribute to the Queen, Aretha Franklin), but might as well be called, "Women of Soul" A celebration of women with a special tribute to Aretha Franklin. A very long title, but in reality, what this talented troupe is bringing to Chicago. As usual, they do so with talent that rocks Clark Street." "...Black Ensemble sets their bar high by structuring its productions around famous musical geniuses, and they always find the best vocalists in the city. Early on in the show, Robin DaSilva sings �Trouble of the World� by legendary contralto and queen of gospel Mahalia Jackson. Attempting to cover this iconic and notoriously haunting song, featured in the film �An Imitation of Life,� would spell certain doom for nearly any vocalist, yet DaSilva handily lays to waste the emotions of the audience with her rich, booming voice." "...And a salute to the great Women of Soul wouldn't be complete without a special tribute to The Queen, Aretha Franklin. Each of this magnificently accomplished cast has her moment in this medley, as they perform just a few of the unforgettable hits from the Franklin songbook. The audience jumps to their feet with tunes like, "I Say a Little Prayer," "Think," "A Natural Woman" and one of her most imitated songs, "Respect." For audiences who love these singers and their signature songs, who live for soulful sound of the American Songbook, this is a must-see production that raises the rafters on the corner of Clark and Sunnyside." "...Last and best is the roll call of the 10-member ensemble. I�ll lead off with Rhonda Preston, Cynthia Carter, and Robin DaSilva who carried much of the heavyweight vocalizing. But that isn�t to short change the star turns by Ariel Williams, Colleen Perry, Jayla Williams Craig, Jerica Exum, Jessica Seals, and Hannah Efsits. And props to Dwight Neal for the bits of acting he provided for the dispensable small playlets. Neal gets his star shot, bringing down the house as Rick James in the Teena Marie duet that leveled the house. A joyful evening!" "...Though the aforementioned are some of the standout stars of the show, the company is devoid of any weak link. The entire ensemble has an exciting and energetic chemistry that keeps the audience engaged with each new song. Supported by a band able to deftly fine-tune itself to the style of each song, these women of soul knock every song out of the park." "...The Black Ensemble Theater, founded in 1976 by Jackie Taylor, has been dazzling audiences ever since with original musicals. 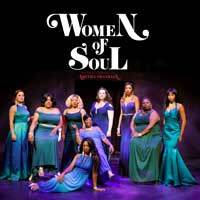 Its current production, �Women of Soul,� written and directed by Associate Director Daryl D. Brooks, is a tribute to many powerful female singers who cover different genres and numerous years."